Cupcake purse. Or is it a mushroom house? Dorénavant le blog est en français sur Over-blog. La version anglaise reste ici. I've been contemplating making this purse for a while now, as soon as I saw this pattern. I love purses. I don't know why we don't carry round purse like in old times anymore. It's a shame. It's nice to make, but I couldn't decide the top colour. I didn't want to make it pink, even if it's what is expected of a cupcake, because I wanted to be able to go out with the purse. So I went for purple, but then DBF thought it was a smurf house, he saw a mushroom shape instead !!! 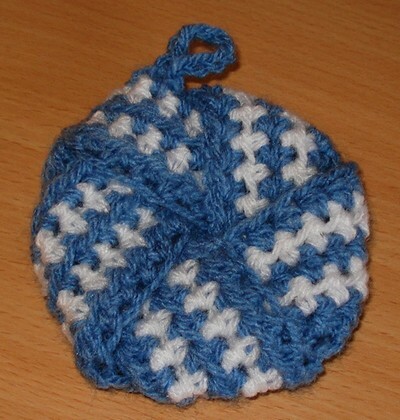 I continue crocheting different tawashies. Here is another traditional japanese pattern. At first, it's easy : just crochet a long band. But then you have to fold it in such a way it looks more like origami than anything else. But there you go ! Looks nice, right? If it's always easy to find something to make for moms (a bit of lace, an accessory, even stuff for the kitchen), it's harder to find something for dads. This year I decided to tap into one of my dad's oldest habit : drinking coffee ! He drinks coffee all day long, and carry his mug around. So a coffee mug cozy seemed the perfect gift. 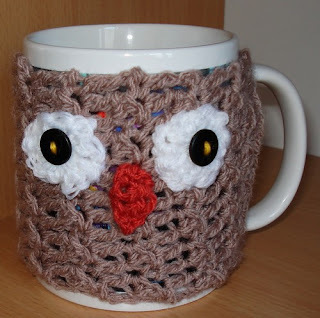 I find this pattern of a owl cozy, so cute I had to make it ! 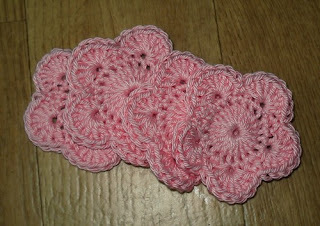 And as a plus, I discovered a nice crocheted texture with dcs, and sls. 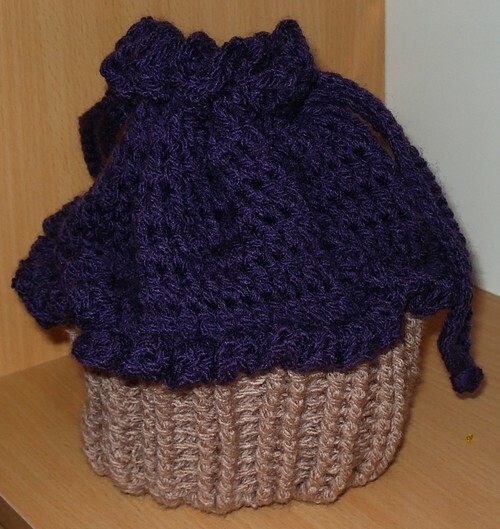 With a nice thick yarn, it could make a lovely cozy just by itself ! I was surfing around, when I saw "All about Ami" who was in a slippers craze. She was making several pairs from the pattern at "Little house by the sea". 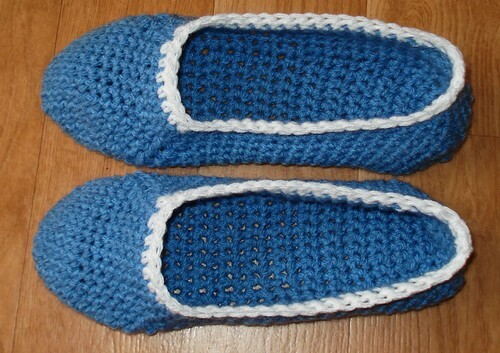 So I wanted to make slippers as well. Problem is I had several wrong starts. 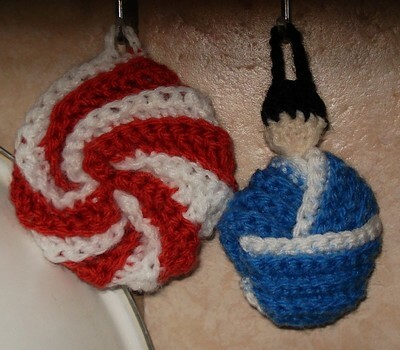 I tried with a 4mm hook, but even my small foot couldn't fit in the slipper. I tried a plastic 5mm hook, but it doesn't slide properly, and there were too many holes. I set that projet on the side for a while, made tawashies with a 5mm hook, but coated steel this time; and it was so lovely to work with I started the slippers again. And tadaaaa !!! Here they are !! I added 2 rounds to make it higher, but I still think it's too narrow or something, so I might try to make some with a bigger sole. A perfect excuse to make another pair ! Of course, we can always count on DBF to lighten the mood. When he saw me making slippers, he said "oh, she's poor, she has to crochet her own slippers". Hum, this isn't the point, is it? Recently I started making tawashies to clean the dishes. But I heard that using cotton instead of acrylic is good for washing our bodies. Or making make-up remover pads. So far, I used them this morning, I had to use two, and they are a bit scratchy, but maybe they will be softer after a wash or two? 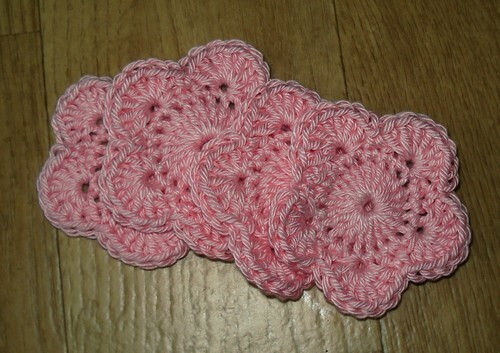 For some time I've seen those strange crocheted dishcloths made out of acrylic to clean dishes. I have to admit I was a big sceptic as to the efficiency. But I had to try. And the moment that little yarn thing managed to scrub the external bottom of a very dirty pan, I was hooked !!! They are easy to make, durable and machine washable, what do you want more? Ah yes, links to patterns. So go to here for the round one, and here for the doll-looking one.